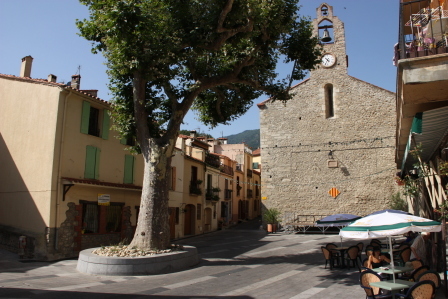 This is the square where the many traditional village festivals were held, some of which are still held here today. It has been renovated between 2008 and 2010. 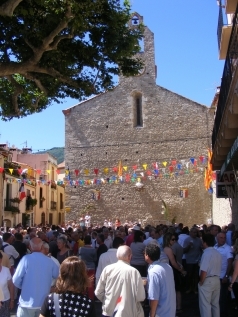 The feast days of the patron saints of Laroque are celebrated here: Saint Félix, 1st of August, Saint Blaise, 3rd of February. Until the nineteen fifties, the wall of the church had been kept smooth because, after work, the village men would use it to play 'pelote' against it with their bare hands. The plane tree, originating from Asia, was introduced into France in the first century A.D., probably by the Romans. It was planted by the villagers as a tree of liberty in 1830 on the abdication of Charles X and the accession of Louis Philippe, son of Philippe Egalité, who symbolised a return to liberty. In 1930 the villagers and the school children celebrated its centenary. It is said that this square is a typical representation of France as you can see the church, the road to the castle and the Republic Square, all at the same time.